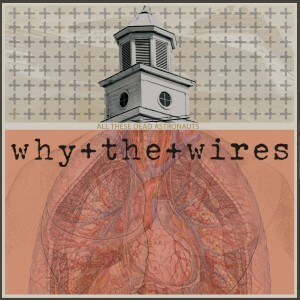 Well for Ithaca, New York based Why+The+Wires, you’re best plan of attack would be to sit back, let yourself become absorbed and enjoy the unruly mixture of saxophone, accordion, chiming guitars and jittery rhythms. Through the eight tracks of All These Dead Astronauts, the explosion of instrumental variety and grit-laden vocals become a mass of seemingly chaotic, unadulterated post-punk rock with the ferocity to take down any non-believer. From the beginning, you’ll know there is a lot here that isn’t the prettiest, but it is far from the worst; and that’s just how Patrick Lonergan, Chris Romeis, Kevin Dossinger and Dave Nutt prefer it. The foursome take pleasure in their style of rock and soon after you dive in, you find it is like the audible version of Thom Yorke’s “Lotus Flower” dance; it appears all over the place, yet tightly molded to transpire in just that moment. Leaning heavily on the horns, Why+The+Wires mesh a poetic, smoky swagger – as heard in “Another Lung” – that had me caught off guard. It isn’t often you think of jazz and punk in the same sound, but with All These Dead Astronauts there is much more than slapdash pounding on the skins and angry vocals; granted, the vocals fit nicely on the “where the hell did this voice come from” bus. I can’t find the need to lump this in ska, even with the horns and occasional thrashing vocals, and then again it doesn’t feel right to entirely pull in the punk title. As odd as it seems, Nutt, Dossinger, Romeis and Lonergan are everything that shouldn’t work. Then why do I keep coming back to this album? It is fair to say the immediate response to their third album in four years, All These Dead Astronauts, will have mainstream turning up their nose and claiming chaotic nonsense. Those who do, well, we don’t need them anyways. There is a beautifully dark side to Why+The+Wires that will hold your interest without bringing you down or send you fleeing. You just have to give them a chance. Once you do I’m sure you’ll find what I found; a fascinating record that calls to you at the strangest times and allows you to understand growing up while holding tightly to the energy and dreams of youth. This entry was posted in Reviews and tagged album, All These Dead Astronauts, CD, jazz, music, post-punk, Punk, review, stream, Why The Wires by Greg. Bookmark the permalink.